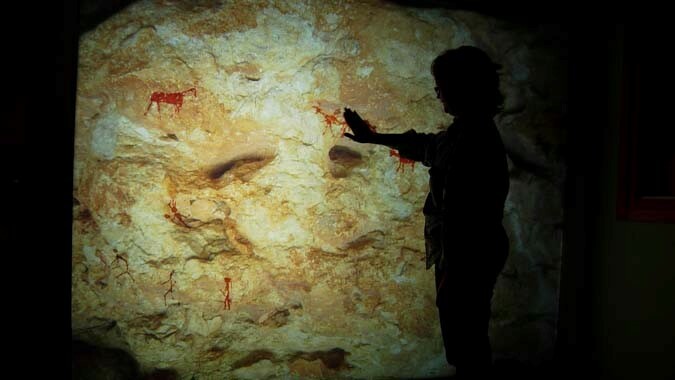 This article presents the “We Hunters” interactive experience, which aims to disseminate the UNESCO World Heritage rock art of Ulldecona (Catalonia) in a playful way. 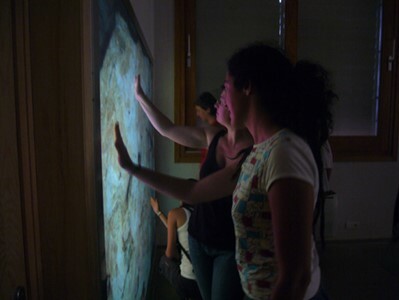 The multi-user touch surface is displayed at the Center for the Interpretation of Rock Art “Abrics de l’Ermita” (CIAR) since 2008 and constitutes a pioneering example of interdisciplinary collaboration, viability of low-cost project, and institutional impact of digital technologies applied to Cultural Heritage. The Rock Art of the Mediterranean Basin on the Iberian Peninsula is considered the largest set of rock-art representation in Europe and was distinguished as a World Heritage Site by UNESCO in 1998 . It is recognized among the most important rock art settlements in Europe, due to its exceptional depiction of human life and fauna, which provides us with information about the way our ancestors lived in the post-Paleolithic era, 8000 years B.C. The rock art sites are located in the coastal and inland mountain ranges of the Mediterranean Basin of the Iberian Peninsula, over 1000 kilometers of coast, from Catalonia to Andalusia, and distributed across six autonomous communities: Andalusia, Aragón, Castilla-La Mancha, Catalonia, Murcia, and Valencia. The paintings appear in shallow open-air shelters, on front walls, and sometimes on the ceilings of the shelters, surrounded by areas with high ecological and landscape values. To date, 757 spots have been identified. They contain figures painted mostly in red and black colors, with a lesser presence of yellow and white . The Godall Mountain, located in Ulldecona, is part of the World Heritage Site. It displays more than 380 figures distributed through 500 meters of rock shelters. The figures contain archers, distinct animal species, abstract figures, and hunting-related elements (animal prints, arrows, etc.). In 2006, the Center for the Interpretation of Rock Art “Abrics de l’Ermita” (CIAR) was built next to the rock shelters. Its purpose was to facilitate access and to promote education and appreciation for the rock art through innovative graphic resources and guided tours . 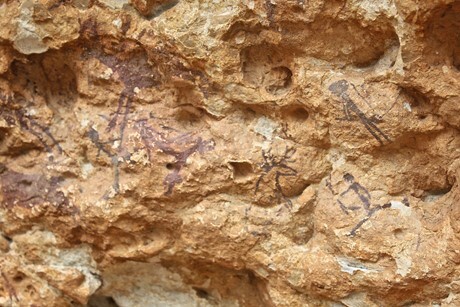 Nowadays, CIAR is part of the Rock Art Route created by the Archaeological Museum of Catalonia. Stakeholders. The project was an initiative of the Ulldecona City Council, which was in charge of execution, coordination, and daily management after implementation. The idea, development, and content production were under the responsibility of Barcelona Media, while the technological development was undertaken by the Experimentation and Interactive Communication Group of Pompeu Fabra University. 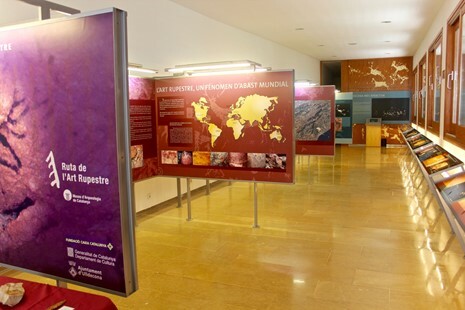 Scientific advisors were Agustí Vericat (Director of the Center for the Interpretation of Rocky Arts Abrics de la Ermita) and Ramon Viñas (Researcher at IPHES, Catalan Institute of Human Paleoecology and Social Evolution). Technical characteristics. 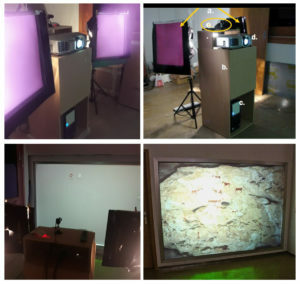 The interactive system comprised the following elements: 1 Windows PC; software developed in Adobe Flash and C++; 1 touch-by-sight screen with 100-point detection; 1 rear projection 240x180cm screen; 1 1024x756 resolution projector; 1 video camera with infrared filter; and 2 diffused-light boxes with infrared filter. Funding and budget. The total budget for “We Hunters” amounted to 34422€. A co-financing system was implemented by the City of Ulldecona and the Catalonia Job Service (SOC). Time of development. The development of the project, from concept to inauguration, took approximately 7 months, between January and July 2008. Modeling process. Seeking to revitalize the activities at CIAR and to establish new ways to put into value its cultural heritage, the city of Ulldecona approached Barcelona Media, an international organization devoted to the creation and management of innovative digital cultural projects. A collaboration was established with the Experimental and Interactive Communication Department of Pompeu Fabra University, and the final team comprised a research leader, a computer developer, two multimedia researchers, as well as an external graphic designer hired for the occasion. They were in charge of designing the technological proposal that best suited the needs and goals of CIAR. Figure 1. Rock art in Shelter 1. Figure 2. Interior of the Center for the Interpretation for Rock Art (CIAR). A first meeting was held with the main intention of identifying the objective of the intervention and the actors involved. During the meeting an important statement was made by the stakeholders: the experience should focus on the rock art of Shelter 1. This was due to its good conservation state, its historical and cultural value, as well as the fact that it clearly represents a narrated hunting scene, which constituted an important passage event in the life of young men (Figure 1). An analysis of the physical characteristics of the interpretation center was also undertaken (Figure 2), in order to establish the magnitude of the technological platform to be developed, which should maximize the visitor experience given the actual arrangement of the exhibition. The team decided to develop a digital platform that would strengthen the educational experience while being fun and easy to use, both by children and adults. This is how the “We Hunters” interactive game was born. The Pompeu Fabra research team had already great experience in the development of interactive digital projects. Therefore, the most accessible technological elements in terms of costs, maintenance, and accessibility were identified and integrated. The system that runs “We Hunters” comprises the following elements (Figure 3): a) Infrared lights, to detect touch positions on screen; b) a piece of furniture, to support the equipment; c) a computer, to control the whole experience; d) a projector, to display the experience; e) a camera, to detect touch positions on screen; and f) a 240 x 180cm screen, to display the experience and act as touch surface. Figure 3. The main technological components of “We Hunters”. From left to right and top to bottom: infrared lights; overall view; back side of the screen; front side of the screen. As previously said, the game used the scene represented on Shelter 1 to achieve a greater impact and strengthen the image of the paintings. However, during the designing process, it was also considered that rock art embodies the geographical characteristics of its location, which are directly linked to hunting dynamics. The features of the rock shelter were therefore portrayed as the staging context of the game, and therefore affected the figures’ movement and hunting strategies. To test the functionality of the game, different tests were carried out with children between ages 8 and 11. They provided practical information that allowed making the appropriate adjustments. To structure and develop the final version of “We Hunters”, the understanding of the following elements was considered: game dynamics, rock art representation, movement, strategy development, and multi user interaction. “We Hunters” was a pioneering project in Catalunya. It constituted the first important research project developed by the Experimentation and Interactive Communication Group of Pompeu Fabra University in Cultural Heritage, and it was amongst the first of its kind to be implemented in Catalunya. From the perspective of Ulldecona City Council, the project aimed to develop innovative tools to promote the cultural heritage linked to the city. Since its inauguration in July 2008, “We Hunters” has contributed, directly or indirectly, to increase the number and diversity of visitors to CIAR. Although we do not have the means to identify how many of the total number of visitors had a direct interest in the “We Hunters” application, it is important to highlight the sustained yearly increase in visits to the center (Figure 4). Figure 4. Yearly visits to CIAR from 2012 to 2017. Data provided by the Information Center of Ulldecona. Similarly, the information provided by the Ulldecona Tourist Information Office shows the popularity of CIAR as the main cultural attraction of the city (Figure 5), which has strengthened the image of Ulldecona as an important tourist and cultural destination. Figure 5. Annual visits to the major tourist attractions in Ulldecona . According to Agustí Vericat, director of CIAR, the development and daily management of such an innovative application had different effects at institutional level, leading them towards new dynamics in the management of the interpretation center. One of the main challenges (due to the increase of visitors) was the need to have more staff for visitor assistance. To that end, they hired the services of the company Conficon Hostess, which provided professional guided tours to the shelters and the interpretation center. On the other hand, the presentation of “We Hunters” in symposia, talks, meetings, and specialized publications related to Cultural Heritage and technology over the years has had an impact on the generation of visits to the interpretation center. It has also had an impact on the scientific image and recognition of CIAR, since it has been key in the more than twenty invitations received by the institution to talk about its experience in the promotion of heritage and the use of technologies. Even though the Interpretation Center is of moderate size, with limited resources and funds, multi-sectorial collaboration allowed the development of the experience, enhancing innovation in education and Cultural Heritage, and turning “We Hunters” into one of the most distinguished cultural projects in the region. The success obtained with “We Hunters” laid the foundations to develop other heritage promotion projects such as e-ART (augmented reality) and 4D VULL (high-format photographs and 3D development). On the other hand, its good relationship with other research institutions has allowed CIAR to participate in projects contributing to the development of new, less invasive research procedures in cave paintings, which has led to significant contributions in Anthropology. Its educational relevance has attracted an important number of students from different academic levels, maintaining a constant flow from schools and universities that find in “We Hunters” an important educational tool. In this sense, the agreement with schools has directly had an important impact on the generation of visits to CIAR. 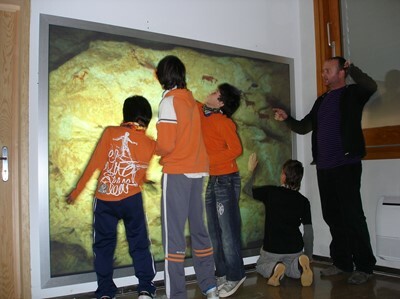 For instance, CIAR has an agreement with the “Ramón y Cajal” public school of Ulldecona to organize school trips to the Interpretation Center. This allows students to enjoy every year a special guided tour and an opportunity to experience the “We Hunters” interactive game. According to the schools, the scope of “We Hunters” goes beyond the facilities in which it is located. It constitutes a tool for the dissemination of cultural heritage, thanks to which adults and young people (Figure 6), both foreign and local visitors, can learn in an enjoyable way. Figure 6. Young students at “We Hunters” display. “We Hunters” constitutes for CIAR an important means to bring European prehistory to a diverse audience in an unconventional way. The project development itself represents a successful collaboration between private and public entities. In this context, experts and professionals from different sectors and knowledge domains worked together to generate a unique heritage interpretation tool. This experience established a reference for the development of similar projects that seek the promotion of Cultural Heritage through innovation and technology. After almost 10 years in operation, and despite its low budget, the “We Hunters” installation is still working and has generated multiple changes and benefits at institutional and scientific level. The development of associated cultural projects has also had positive results in the tourist activity of Ulldecona, thanks to the diversification of audiences and the attraction of a more family-oriented visitor interested in the gastronomy and culture of the city. The role that CIAR played in this and other innovative projects has consolidated it among the leading regional institutions regarding the dissemination and preservation of cultural heritage. “We Hunters” constitutes an interesting case study because it gathered very diverse organizations around a non-mainstream topic related to regional cultural heritage resource to generate a low-cost easy-to-manage installation and a via to connect heritage with young students. It is important to continue developing and evaluating projects that incorporate digital technologies in the area of ​​Cultural Heritage in order to maximize their benefits and opportunities both at local and international level. We would like to express our gratefulness to Agustí Vericat González, Director of the “Abrics the L’Ermita” Rock Art Interpretation Center, for his kindness during in-situ research, as well as for his important contribution with information and photographic material. Many thanks also to Narcís Parés Burgues, Professor at Engineering and ICT Department of Pompeu Fabra, who kindly provided all the technical information related to the ideation and modeling process of the “We Hunters” project. Díaz-Andreu, et al. 2015. From “doodles” to World Heritage: assessing the impact of the inscription of The Rock Art of the Mediterranean Basin on the Iberian Peninsula (Arampi) on the World Heritage List. Proceedings of the II International Conference on Best Practices in World Heritage: People and Communities. pp 766.